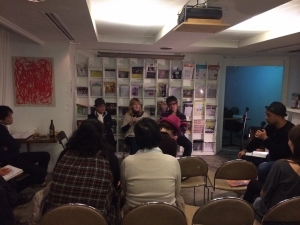 On Saturday night (1st February) I was invited to give a book-reading and take part in a talk show with two other picture book creators who live in Koganei - Kuroki Osamu and Miyamaeito, at the Chateau Art cafe. Chateau Art cafe is an open and friendly cafe/bar that holds all kinds of events connected to art, music and storytelling. It is one of my favourite places to hang out. It was really interesting for me to watch and listen to the performances of Kuroki-san and Miyamaeito. Kuroki-san gave a riveting performance as he told some local stories connected to the history and mythology of Koganei with his beautiful water colours in traditional kami-shibai style and perfectly timed Japanese percussion. I did my usual storytelling in English using two of my stories (Blue Mouse, Yellow Mouse and Lily and the Moon) with games geared for the smaller members of the audience. In the evening the cafe turned into a bar and people enjoyed a drink while the three of us "storytellers" were asked questions by the MC. All three of us answered differently to the question - what is the process of creating your stories? What comes first - the art or the story? For Miyameito it is the art. For Kuroki-san it is the story. For me, it is the message, something I want to convey comes before the story and the art always comes last. I'd like to thank everyone who took the time to come to this event. You were a great audience! Thank you so much for coming to the storytelling event on Saturday. I totally agree with what you say about English learning in Japan. English is used as a "bridge" between different cultures and a common language and is used mainly by non-native speakers throughout the world now to communicate with each other. So we should forget about this "correct and wrong" approach to language, especially spoken language. As long as we can convey what we want to say, that is the most important point. I am teaching high school students how to give their opinions, give presentations and present creative work because I believe these are the skills they will need most when they go out to work in the future. And never give up learning - the more hours you put into something nearly always means progress and improvement will be achieved. So keep up your study and enjoyment of English, too, Lionel!